Research4Life User Experiences from Global South. Get Inspired & Motivated & Share Your Story! If your institution is located in one of the Research4Life eligible countries and has already joined Research4Life international network, you can access and fully explore resources of interest shared by up to 85,000 leading journals and e-books in the fields of health, agriculture, environment, law and applied sciences ! … a public-private partnership (established in 2002) by the WHO, FAO, UNEP, WIPO, ILO, Cornell and Yale Universities, International Association of Scientific, Technical & Medical Publishers and up to 180 international publishers. The goal of Research4Life is to reduce the knowledge gap between high-income countries and low and middle-income countries by providing affordable access to crucial scientific research. Thanks to these programmes, researchers from more than 8,700 institutions in more than 115 low and middle-income countries have been provided with access to the highest quality online research resources. 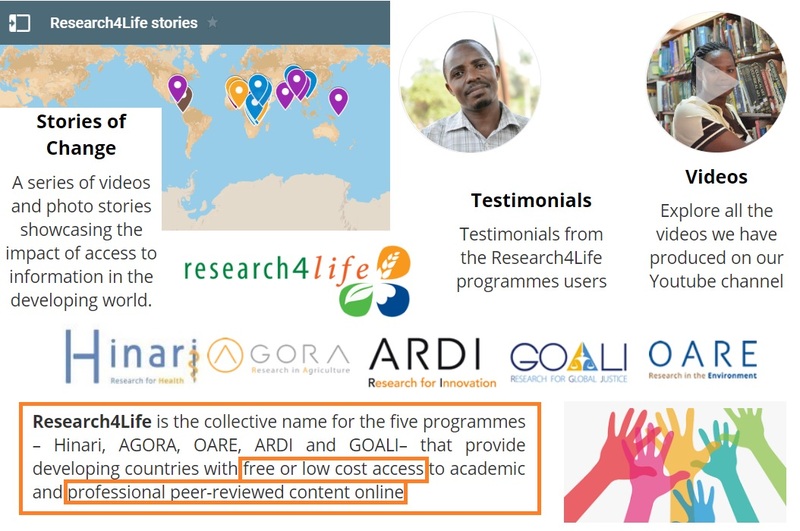 It is all about how the Research4Life programme’s multidisciplinary information resources help users from Africa, South America and South East Asia to foster and advance their knowledge, skills and career! … A LIBRARIAN in Myanmar is modernizing the way of delivering literature to students. … A PHYSIOTHERAPIST in Ethiopia is finding better ways to treat his patients. … A RESEARCHER in Zimbabwe is tackling the burden of diabetes. These are just some examples of the many stories we have gathered to show you how access to information can make a difference and improve the lives of those in need. ... Inspire the global Research4Life community! What was YOUR BIGGEST CHALLENGE (in research, study, career) before you started using the Research4Life programme? What were you thinking when you decided to discover research information resources available through Research4Life? What changed after you started using resources available through Research4Life? What would you say to somebody who is keen to learn more about Research4Life and become a user? Have you already used free Research4Life TRAINING MATERIALS? Have you already used free collection of Research4Life PROMOTIONAL MATERIALS? Do you have an ID photo that you could send us to use alongside YOUR TESTIMONIAL?